The murder of a gay university teen – and the reaction of the community in the days following – will be the focus of Douglas College’s latest production, The Laramie Project. On Oct. 7, 1998, University of Wyoming student Matthew Shepard was tortured and brutally beaten by two men and left to die. The hate crime led to the creation of The Laramie Project, written by Moises Kaufman and members of the Tectonic Theatre Project of New York. The play draws on hundreds of interviews conducted with residents of the town, journal entries and published news segments to tell the story of the aftermath of the murder. The story is one of hope, fear and courage, said director Deborah Neville. “I was overwhelmed with sadness and disbelief when I first read this play. Now, one hundred reads later, I still feel that great sense of loss but I also feel there is hope and a way forward,” Neville said, noting homophobia is still prevalent today. Presented by the departments of Theatre and Stagecraft and Event Technology, the play stars Noah Achielkene (Vancouver), Jaimee Armstrong (Surrey), Sean Brown (Vancouver), James Byers (White Rock), Nina Dosdall (Burnaby), Alice Knechtel (Calgary), Chantelle Pryznyk (Surrey) and Logan Tower (Langley). Featuring Brian Bell on set design, Ines Ortner heading costume design and lighting design by Craig Alfredson. 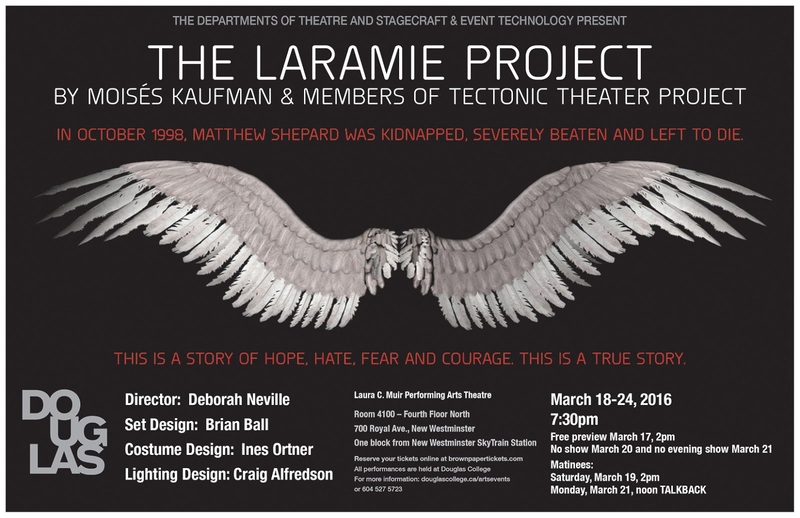 The Laramie Project runs Mar. 18-24 at the Laura C. Muir Performing Arts Theatre at Douglas College’s New Westminster Campus. There will be a free preview on Mar. 17 at 2pm. For more showtimes, see here.